Depressing stories aside, I’ll keep on doing what I like doing best; introducing (possibly) new music from (possibly) new artists you’ve never heard and therefore that you should’ve heard. So, what’s so great about Sea Wolf you ask? Well, to answer that question, you have to be definitely sure, and I’m not definitely sure why. Lame answer, I know. It’s somewhat daft to judge an artist just by a single song, but if we keep seeing songs as one part of a compilation, one part of a collection, one part of a whole record, we’re never able to see a song as it is, in all its bare and isolated glory. I’ve only listened to one single track of his album called ‘You’re a Wolf’, and to be honest, it didn’t really strike my fancy during the first listen. However, it was a song that I knew was rather nice to listen to, but I couldn’t remember why and was probably the reason to why I’ve decided to keep it instead. But, setting it apart from the rest of the list, fully indulging in every indistinct note and key in the tune while the tone starts settling in, it actually grows on you and it’s what most of us have always failed to do; not giving songs a second chance. And a third chance. Or a 25th chance – you get the idea. 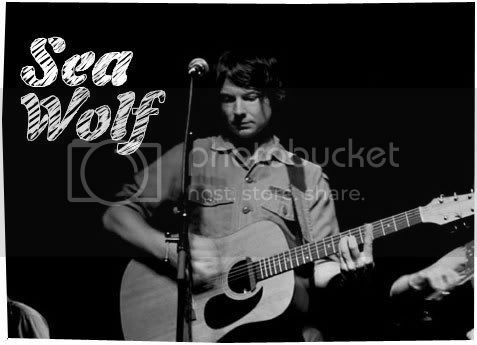 Sea Wolf is made up of one Alex Brown Church, who’s also the bassist and co-singer/songwriter for the L.A. indie-rock band Irving. No one in this blogosphere has of yet anything bad to say about his record, Leaves In The River (which I have yet to take a listen to, and you should too if the opportunity comes) and that just makes me want to listen to more of this great music by Sea Wolf – don’t you?